Such sweet faces! It must be comforting to know they enjoy themselves at school. oh, those cute boys. how special for all of you. They look so cute! 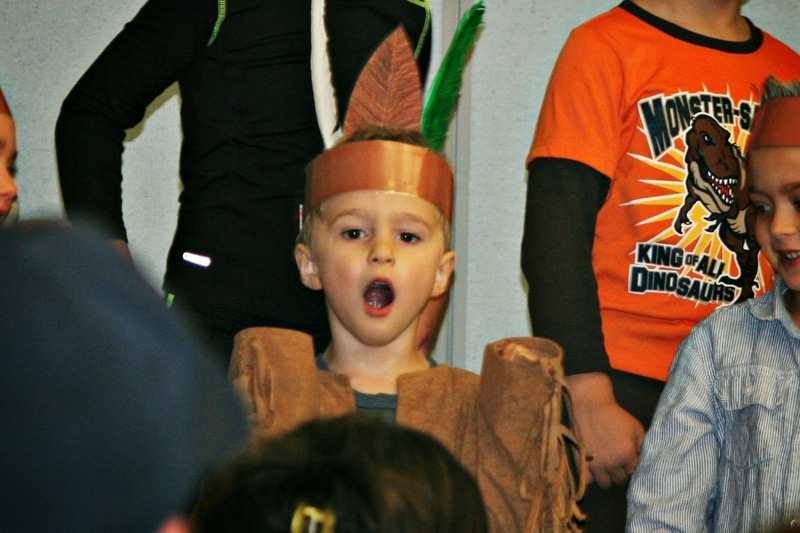 I love that they do a Thanksgiving play. Our kids do a holiday music festival around Christmas. They sing songs about holiday around the world at this time. I enjoy it, but it's hard because it lands on the day my final is. Luckily there are 2 times it runs. I go to the 10:30 slot. My final is at 1. It's still tight because there's back work to grade, and what not. I somehow end up getting it done. LOL so cute Lisa. Too bad you have to work! I bet it is hard not getting to spend as much time with them as you once did. I miss this stuff bad. Got to go to a dance recital last week. Thanks for the input!!!! I could have supplied lots of feathers, we dismantled 12 turkeys and 30 chickens. your camera did a great job; those smiling faces are wonderful! This event looks fun. I think the pictures turned out nice! They were really belting it out! Looks like they had a great time. Oh goodness - how cute they are! This brings back a special memory for me also. Lisa, it is so cool you were able to make this one. And I can see how happy the boys are for you to see their performance. To me, the pictures look great; sharp and nice. They look great! What fun! Awwww. so nice that you got to be there for them. Kids remember that sorta stuff. Is it me or do they look really grown up lately? It's moments like those that are meant to be cherished! 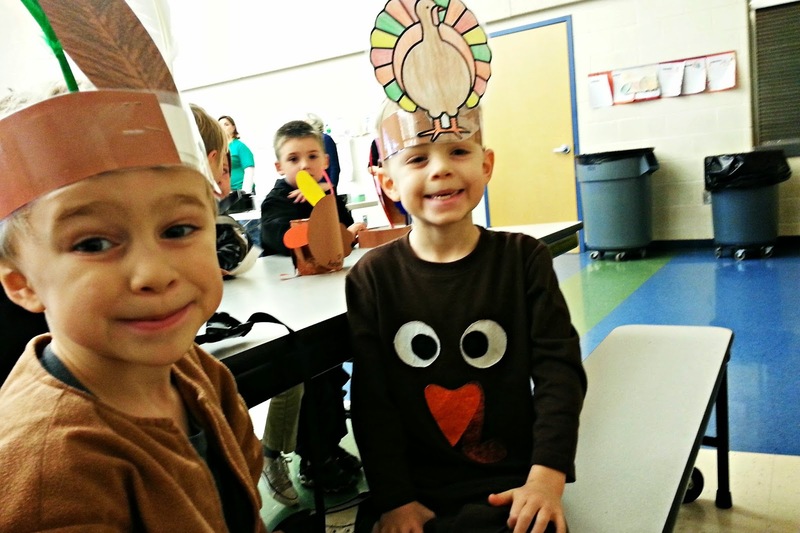 Your kids look cute in their turkey hats. Extra special and extra sweet! Sounds like a good time. They look so cute! oh how cute!! 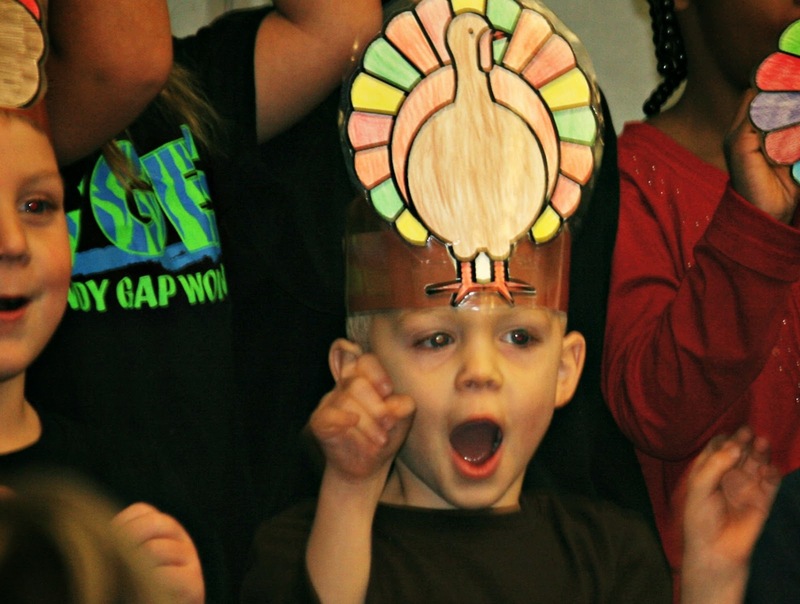 i always enjoyed my kids' thanksgiving plays too! With those headdresses they look like little Inca's. we were unable to comment on your recent post about the bottle you made for the little elves.. we wanted to let you know we visted and love your idea! Watching little kids really get into a performance is one of life's better pleasures...thanks for sharing it! How fun! They are too cute!